In case any of you are interested I’m just putting the word out that at 7.30 on Wed Sept 6th I’ll be giving a power-poem presentation on HERMES as the Archetype of the Imagination and the Poetic Basis of Mind (based on my collection A DANCE WITH HERMES) at BRSLI in Queen’s Square Bath. It would be good to see you there, and please pass on the info to any friends who you think might like to come along. This entry was posted in poetry and tagged A Dance with Hermes, BRLSI, Lindsay Clarke on August 19, 2017 by barleybooks. 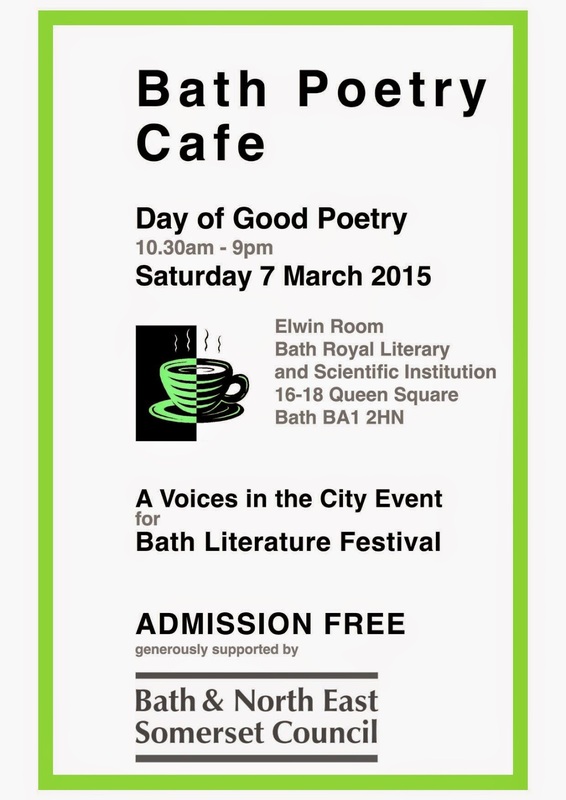 … at the Bath Litfest on 7th March. Six of the Fountain Poets have collaborated in distilling 4629 words of our own poetry down to a half-hour performance script. We shall be spending many hours during the next four weeks rehearsing. True to our name and nature, we will present a flow of words on a watery theme, from the first hint of rain to the vastness of the Atlantic. There will be drought and flood, a birth amid the Glastonbury mud, wild-swimming, danger, a very damp dreamscape, tadpoles, seals, a couple of mermaids and a great many birds. We’ll take the stage soon after mid-day, and our set will be followed at 12.40 by a short Q&A/discussion with the audience between the Wells and Swindon groups about how they compiled their sets. Subversifs from Bath will start the day at 10.30 with their set “Elemental”. Bluegates will follow with “Swindon: the Genius of the Place”. John Richardson will introduce his new pamphlet at 11.40. Another Bath group, Knucklebones, will be on at 2.10 with “Who am I?” This group includes Fountain poet Rosalie Challis. At 2.50 Hannah Teasdale, Jeremy Young and Rosie Jackson will read from their new pamphlets. The Bristol poets will be on at 4.05 with a set entitled “Before”, and at 4.45 there will be a second pamphlet set from Ruth Marden, Rachael Clyne and Sue Boyle. Throughout the day there will be musical contributions from Jon Chambers and Tony Monks. And of course there will be a book-stall! The evening session will start at 7pm with light refreshments, followed by more music, more poets, including Fountain poet Claire Coleman, and the announcement of the short-list for the Bath Cafe Poetry Competition. Please come and support us! Bring a packed lunch and stay all day! This entry was posted in poetry and tagged Ama Bolton, Bath Festival of Literature, Bath Poetry Cafe, BRLSI, Claire Coleman, Clare Diprose, Ewan MacPherson, Jo Waterworth, Morag Kiziewicz, Rachael Clyne, Rosalie Challis, Rosie Jackson, Sara Butler on February 5, 2015 by barleybooks. The venue for our September meeting was The King’s Head. Ama was in the chair and our topic was “Friends and Other Strangers”, which produced a wonderful variety of mostly true stories of people we have known – playground bullies, friends both faithful and treacherous, imaginary friends, colleagues, neighbours and strangers observed. My title is taken from Rosalie Challis’s poem “Role-call” which explored the relationship between a portrait-painter and his model. 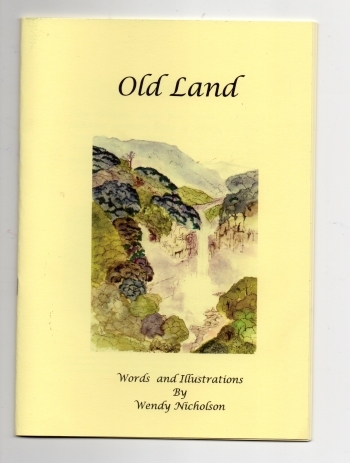 Wendy Nicholson, our local Beatrix Potter, has produced a new book. It’s beautifully written and illustrated and absurdly cheap at £2, which goes to Northern Red Squirrels. It would make a lovely present for a child of any age. 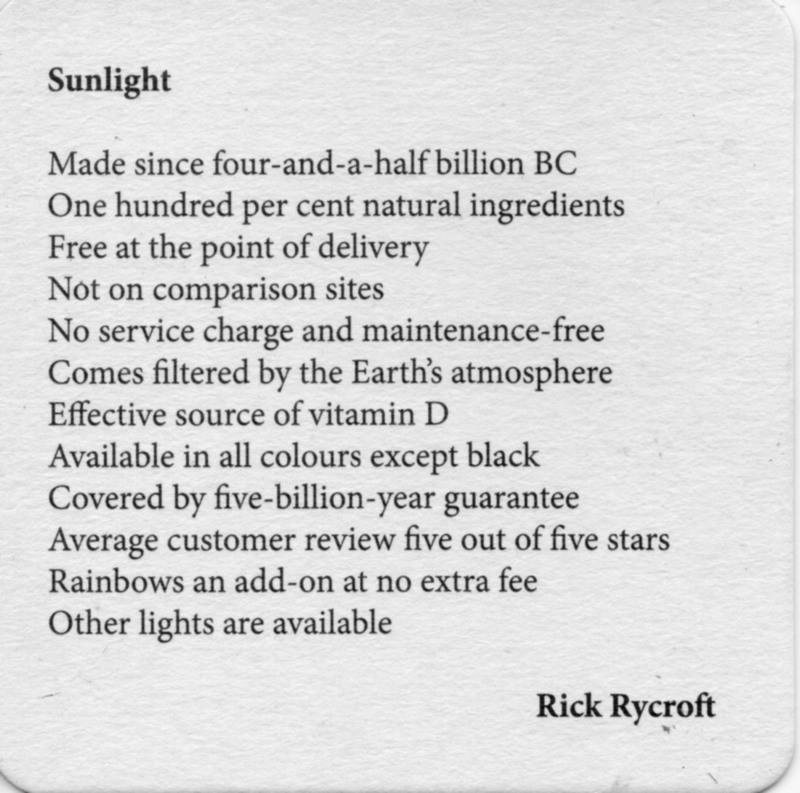 This year’s Bradford-on-Avon Poetry Competition has resulted in a set of ten beer-mats featuring the short-listed short poems on the subject of Light. What a great idea! They can be found in pubs in and around Bradford-on-Avon, and the set can be purchased for £5 from the organiser, Dawn Gorman, dawngorman37(at)virginmedia(dot)com. There is an evening of poetry, including memories of Laurie Lee, on Saturday September 20th at The Red Brick Building in Glastonbury. For details see the RBB website. On Wednesday October 1st at 7.30pm in the Bath Royal Literary and Scientific Institute in Queen Square, local poets Rosie Jackson and Jeremy Young will be launching their début pamphlets; do go along and support them if you can! Our next meeting will be at The White Hart Hotel in Sadler Street on Monday 13th October. The room is on the ground floor at the back. It will be in use by another group until 7.30, so if you arrive early please wait in the bar. For those coming from Glastonbury and Street there is parking nearby in the Market Place. If you’re coming from Bristol/Bath/Frome a more convenient parking place is St Andrew Street, alongside Cathedral Green. Walk through the archway onto Sadler Street and the White Hart is directly opposite. Rachael will be in the chair and has chosen “Nearly” as an optional theme. Off-topic poems are welcome too, of course. 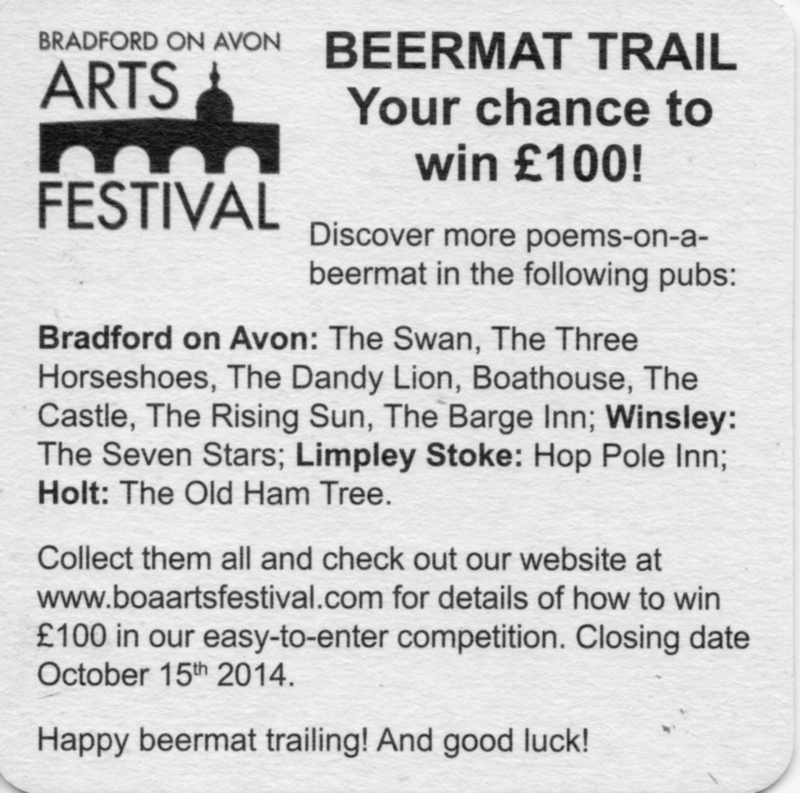 This entry was posted in Books received, poetry and tagged Ama Bolton, Bradford-on-Avon, BRLSI, Dawn Gorman, Jeremy Young, Laurie lee, Northern Red Squirrels, Rachael Clyne, Red Brick Building, Rick Rycroft, Rilke on Writing, Rosalie Challis, Rosie Jackson, Wendy Nicholson on September 11, 2014 by barleybooks.